I`m using BitComet 1.29 X64 sorry. Are you using a local disc drive, or external? 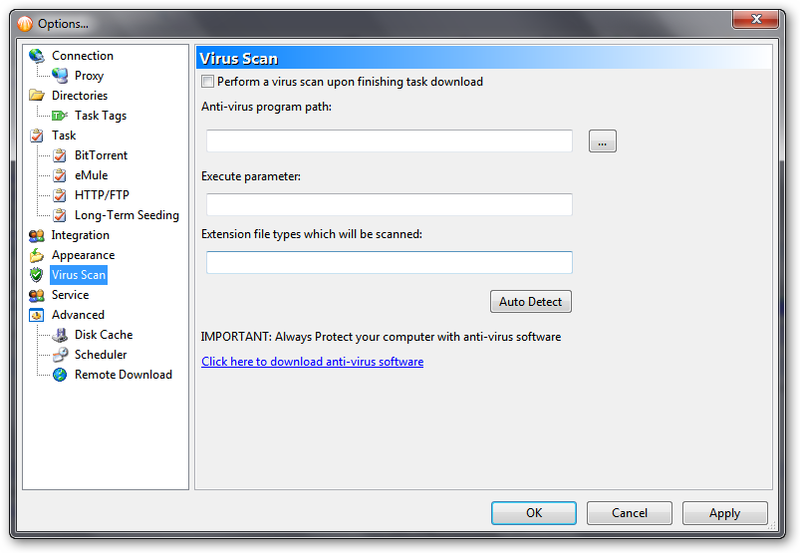 and is bitcomet set to initiate a virus scan upon completion of a task? 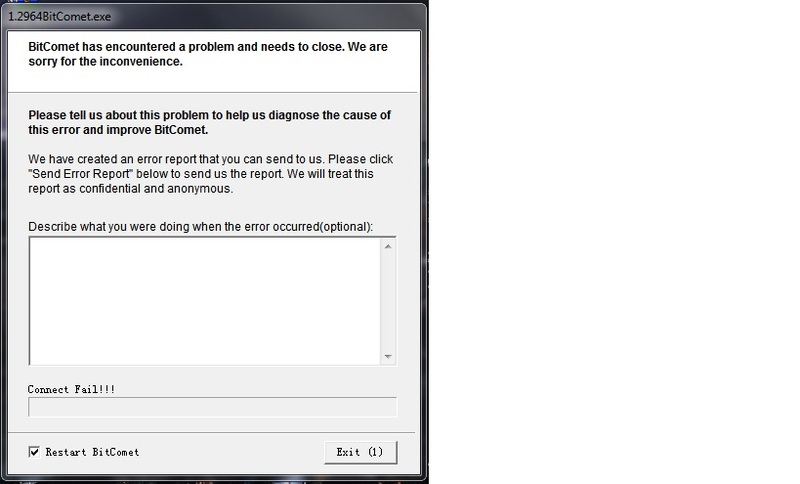 Local disk,i have a antivirus ( avast 6 ) but i did not set bitcomet to scan task on finish, another problem is that i can't report the crash , see pic. Check and see if bitcomet set up a scan upon completion, if so, uncheck that option. Also, do you have it set to do a redundant hash check when task completes? and does it crash on every task? only on torrents? or is it intermittent? ps. are you using any IP filtering programs like peerguardian/peerblock or protowall? I don't use peerguardian/peerblock or protowall , i have found the bug that cause the bitcomet to crash,it's the new implantation bittorent.hash_check_if_file_changed, because with the option Add .bc! file extension to unfinished file it will crash after download complete because BitComet will hash check the file on finish, ( he thinks the file has changed because on task complete it will remove .bc! extension) i hope you understand what i`m trying to see my English is not the best, unselecting the option Add .bc! file extension to unfinished file has resolved my bug, it was crashing only on some tasks not all,this is the bug from bitcomet as he thinks all files changed after download because of the .bc! extension with option bittorent.hash_check_if_file_changed. It was crashing when download finished on file http://thepiratebay.org/torrent/6697893/TuneUp_Utilities_2012_12.0.600_Beta_6_Multilingual_Portable , Thanks for the help and hope it will help you fix the bug. The bug will happen only if you have enable bittorent.hash_check_if_file_changed and Add .bc! file extension to unfinished file ,disabling one will fix the bug. GUI Improved: new setting in advanced option page to enable/disable auto hash check after downloaded file changed <==== THIS IS THE BUG THAT CAUSE THE CRASH , starting 1.26 + Add .bc! file extension to unfinished file ,will cause the crash. Not scan the file if the .bc! extension has been removed as it's the same file. The same crash if you enable hash check file on finish. I think it's antivirus related ,but it's crashing only with the 2 options i have told you about,i`m using Avast Internet Security 6,ask other people if they have antivirus as i see i`m not the only one who has the crashing problem,Thanks. The option to add .bc! and for final hash check have existed for a good long while, over 50 versions so I don't think this is the cause. Harddrive and/or file system errors could cause this, or improper initiation of an antivirus scan. I asked you to check to confirm a/v scan wasn't enabled in bitcomet, it's in the options, if you can't find it, I'll point you to it. I might be slow to reply the next few days, My computer is in pieces and I've been using an old dinosaur that can barely open one page at a time. No i did not enable scan on task finish. I didn't ask you if you enabled it, I asked you to check if it was enabled. It was disabled i don't use it. I see that on your screenshot now, it didn't load the last time I viewed this thread. 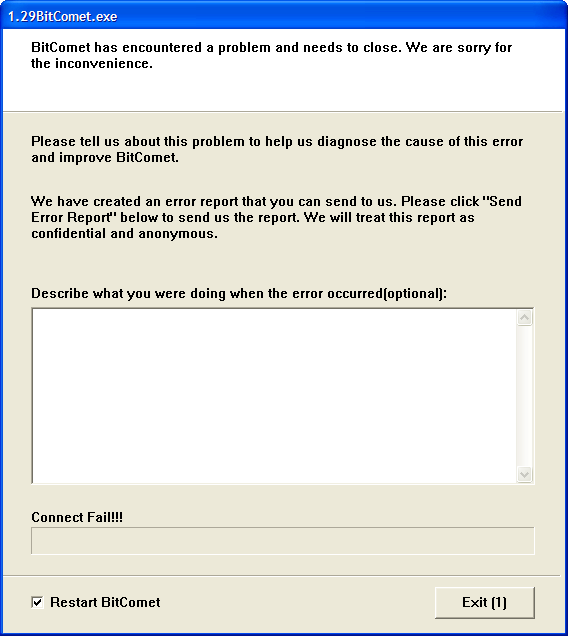 I've also been trying to reproduce this error and can find no combination of options to make bitcomet crash. This won't trigger a hash check if bitcomet renames the file, it only hash checks files that have been altered since bitcomet last used them. ps. could the rest of our staff and beta testers see if this can be reproduced? Edit: I think I may have just found something here, I'll report back later. Ok, so far I've determined that the task you linked will crash under Windows 7 x64 if you enable "add bc! ", "hash check upon complete" and "hash check if file changes". Additionally, on my Windows 7 ultimate x64 PC, when bitcomet crashed, windows prompted me that it had to change compatibility settings for bitcomet. After this change rerunning the same task didn't cause it to crash. On another PC running Windows 7 home premium x64, it crashed with no such prompt about compatibility, and redownloading the task caused a second crash. Further testing is needed, but I'm going to consider this bug as verified and pass it on to development. Thank you for the report, this issue has been forwarded to the dev team. The development team is working on the crashdown issue at the moment, but we are not able to reproduce the error yet. We will keep trying, once this error is fixed, you will know from the changelog of a future version. Yep, it crashes on XP SP3 32 bit too, both on the beta and on the v.1.29 stable. Except, not exactly every time (one time it didn't). The crash reporting routine says "Connect fail !" as well (BTW that should be changed into "Connection Failure" or "Connecting Failed"). Thanks solar, if you're inclined to try, see if disabling the bc! file extension stops the crash problem. When testing it's best to use a small torrent and repeat the download several times, this reduces the possibility that other factors are causing the problem. As for the disc cache, it will keep common bittorrent pieces in ram memory, but bitcomet will still need to access the harddrive for pieces that aren't in ram, and for normal application use. Windows will also use the disc for virtual memory, so you can't stop all disc activity with a big disc cache. Also, if you're going to run a large disc cache, use bitcomet x64, it doesn't have the memory limitations that 32bit apps have. So far, in fact, the only real reason for the 64-bit app is the ability to use huge cache sizes, at least as far as I can tell. Dev team leader just told me that the error report server is out of service, and my teammates are trying to fix it asap. During this period, the error report may not work properly, and users can't see the submit buttiom. I am also experiencing NTDLL.DLL crash everyday, upon file download complete, maybe 30 to 50 times a day. Before using the 64-bit version, I experienced the same crash on 32-bit 1.29. Upgrading to 64-bit did not make a difference at all. It was very disappointing. Try running it in vista compatibility mode see if it helps. There are a few optional things that bitcomet will do when a task is complete that aren't required. One is a final hash check, the other is to rename the files to change the file extension from .bc! to whatever the files originally were. I understand why many users like using the .bc! file name option, so you can look at a file and know if it's complete without opening bitcomet, but if you're having this problem and can't track down the cause, I'd suggest turning off this option too and see if it makes a difference then report the results. It would be best to make one change at a time so any improvement can be linked to a specific change and we can report the findings to development. If you make several changes and your problem is fixed, it will be of no help to millions of other users and we are after all a community that are here to share, so I encourage everyone to help in the process of improving the product.